I thought it was growling at first. But it was definitely a purr. I stroked behind its ears. I tickled under its chin. And then with its rasping tongue it licked my arm, and licked, and licked. “That is how it tenderises its meat,” the handler Dumisani Ncube said with a great guffaw which sounded like it was at my expense, an in-joke between him and the spotted one. I felt subversive, at one with wildest Africa and at one with the Pharaohs who thought cuddling cheetahs was something spiritual or immortal. It is not, it is not something that the cats should be subjected to. The theory behind the Emdoneni Cat Rehabilitation Centre in Hluhluwe is that damaged animals will be nursed back to health and sent back to the wild. 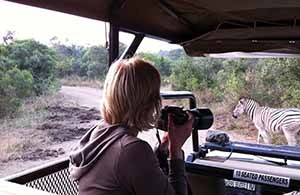 They haven’t released any cheetahs, but they have released eight servals, seven caracals and two wild cats. The animals are given Disney names (mine was Moya) as part of the deal. It’s what these places do to generate funds to keep their projects going. The first challenge for visitors to Hluhluwe-iMfolozi is pronouncing the name. It is a contender for the most unpronounceable tourist attraction on the planet, more like shlush-lewy, with a very light emphasis on the L.
Our base was Hluhluwe river lodge, a family owned lodge perched on a ridge over the river valley, a shadow of its former self thanks to eight years of drought. Cyclonic rain in February and March failed to solve the problem. 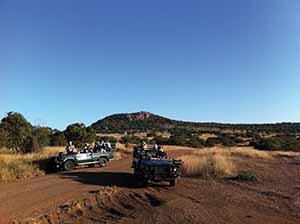 We met some black rhino almost as soon as we embarked on our first game drive and ascend the low hills t look back on the world’s very first wildlife park – five years ahead of Yellowstone, our guide Garth Larrett declares proudly. “Do you know the mating call of a hippo?” Garth asks, “me neither.” Garth entangles us in acacia bushes when he goes offroad. Hluhluwe is rhino central. The animal is under real pressure from a new poaching epidemic (200 lost so far this year, up to six a day) as rhino horn fetches a higher price than gold. “Saving private rhino” is the one of the more clever names of one of the projects to prevent this happening. The rooms at Hluhluwe river lodge are plush self-contained buildings with fetching gecko droppings on the sheets. There is a small and deep pool in the centre of the lawn and picking your way back from the bar or the pool at night time it is natural for every log or leaf to take on an a mysterious life of its own. Someone spotted a python coming through the lodge grounds day before we arrived. The daughter of the owner fears for her hens (three of them were lost to a genet, while Sprinkles the chicken was taken by an eagle). 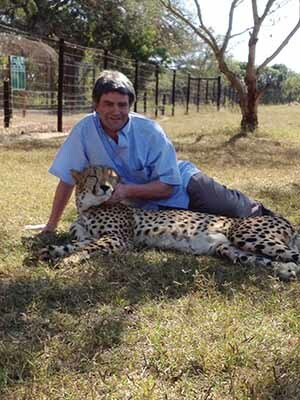 Bryan Olver trains many of the guides who do game drives in private lodges all over Africa and he is an amazing game drive companion. He wears his knowledge lightly: the impala is the world’s most successful mammal. All the young arrive together, flooding the predator market, and the dominant male gets booted off the harem when he gets out of condition. The impala are everywhere, the McDonalds of the bush, lots of them, everyone east them, very tasty and they even have an M on their backside for good measure. I have long held that the best way to see animals is from another animal’s back. At Hluhluwe River Lodge adventures they threaten me with a retired racehorse called Danzig Lane. Instead I get Spike, a feisty eleven year old Polo Pony with a mind of his own and no second or third gears. Elmarie Larrett warns us about hippos in the reeds as we descend to the lake. Phinda Mountain Lodge won’t let guests lock their doors. Our hostess Tammy Vermaak explains why. There are no fences around the Lodge, so you might need somewhere to run if you meet a predator on the lodge grounds. They aren’t joking. In 1994 one of the guests slipped away from the dinner table to fetch her jumper and was eaten by a lioness. Nowadays they get a guard to accompany you back to your lodge after dark. They had a hyena call last week, today a nyala stopped by to drink at swimming pool, and there is a rainbow skink in my own personal plunge pool as the sun descended over the valley and the cicada chime ushered in the African night. The ecotourism group @beyond like to style their dining areas by the Zulu traditional fiesta term Boma, part of their mission to pay homage to local culture. We dine on warthog in the boma at Phinda Mountain Lodge, with sand at our feet and glowing flames in the centre of the faux-tent structure. It is very wild-boar in taste, like gamey pork and I try to get the Disney cartoon out of my head.